A Pichu's Pichu Blast can only be learned by a pichu,pikachu,or raichu.It can defeat a pokemon 6 times stronger than itself. Search your deck for any level x,EX,rare prime,legend.Show them all to your opponent.Put them in your hand afterwards. 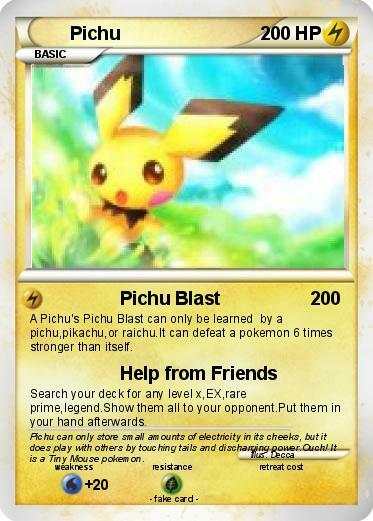 Comments : Pichu can only store small amounts of electricity in its cheeks, but it does play with others by touching tails and discharging power.Ouch! It is a Tiny Mouse pokemon.